This meal was a delicious source of fiber that kept me going all day. It is recommended that you get between 25 and 35 g of fiber a day. This lentil and pasta dish will put you almost half way there with 13 g of fiber for this serving. 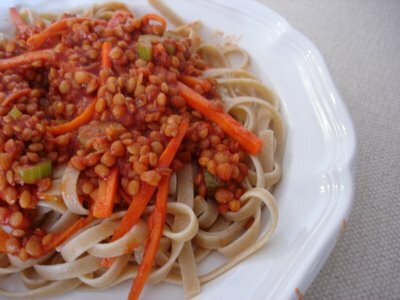 The whole wheat linguine from Italpasta boasted 7 g of fiber and the lentils 6g. Fiber helps you stabilize your sugar levels and keeps your insulin levels in check. With foods high in fiber the sugar strands take more time and effort to unravel, allowing the sugar to make its way into the blood stream in a nice easy flow. This meal was also a carb loading effort. I went to a nutrition for women course once that suggested women should load up on carbs just before their menstral cycle begins. Consumption of more complex carbohydrates may relieve PMS symptoms since carbohydrates drop seratonin levels as they raise insulin levels. Great fiber post. I love that you enjoyed such a good-for-you meal. I am a believer in tons of fiber and try to eat products that give you a lot of "bang for the buck," so to speak, fiber-wise. Pre-menstrual or not, getting good amounts of fiber in the diet is one of the best things we can do for our bodies on a daily basis. Nice post! Thanks, dragonslayer!